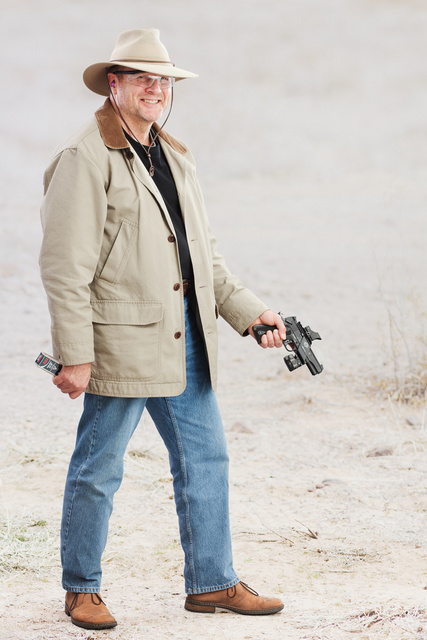 Rimfire M1911, green dot sight, green laser/light — great for teaching newbies and entertaining everybody else. Henschel hat again. $20 worth of good rimfire ammo lasts a day at the range. Next time, I’ll add a sound suppressor to make this a perfect combo. This entry was posted in light/laser, pistol, weapon and tagged 22LR, CCI, desert. Bookmark the permalink. 2 Responses to Inexpensive range trip with M1911? My GSG loves the Federal bulk pack ammo. 525 rounds for under $20, gotta love it! Great catalog shot. Chill actor. The colors are well balanced and coordinated (hat to jacket fabrics and hat/collar/button embellishments to shoes.) Neutral, universal character concept. Move the lighting, not the wrist. I want to see the gun and holder as one solidified object, as though the gun is a fitting grafted into the hand. A mod. An extension. No bend. No pivot. Wrist is a locked joint, hand is a piston, in a 180, arm-gun line. The wielding hand is not present for display, communication or use. It is focused on its primary task as the executive order between the mind and the gun. It is the on of switch between will and capability. It is alert, aware, and vigilant. Why is he carrying a package of bullets?